A Wee Bit Strange ← You Want Me To Wear What? Pins have their place and time. My grandmother often wears an unusual pin on her jacket, and it can look very stylish (then again, my grandmother is remarkably chic). So, I like pins. I get pins. Most of the time. Clearly, in this case, I’m missing something. Why would you pin a bladder to your jacket? What does that achieve? Yeah, it’s kind of quirky, but it’s not that quirky. I mean, the socks that looked like shoes were quirkier than a pin that looks like a bladder. I mean, at least with the socks that look like shoes, you can see how the thought process went. Designer 1: Hey, what if we made socks that look like shoes? Designer 2: … That’s just quirky enough to work! Designer 1: What if we made pins that look like organs! Designer 1: We can draw them like little cartoons, and give them clever names. Like, we can draw a little cartoon bladder, and we can call it the “You’re in for fun” pin. Designer 2: Oh, like urine! Got it. Yeah, that’s just quirky enough to work. Those are a lot of steps involved in the creation of a pin that looks like a cartoon bladder. As was evidenced by the socks that look like shoes, the more effort required, the less quirky it is. So, if you’re wearing a pin with a cartoon bladder on it, you’re not quirky. You’re just trying to be. And trying makes you even less quirky, so really, when you wear this pin, you’re one of the most normal people in the world. 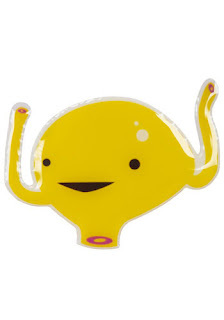 Just a normal person, wearing a pin shaped like a cartoon bladder. Now don’t you feel like a jackass?